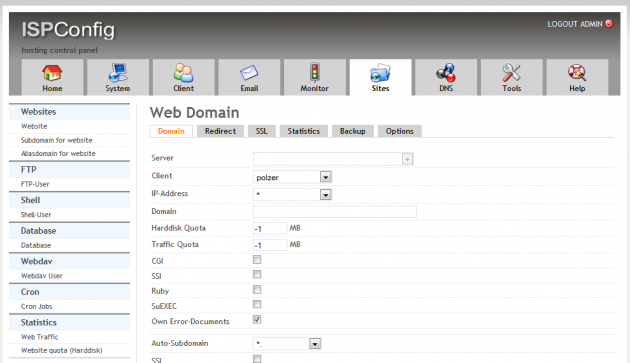 The advantage of cPanel or Plesk is easy to use user interface. 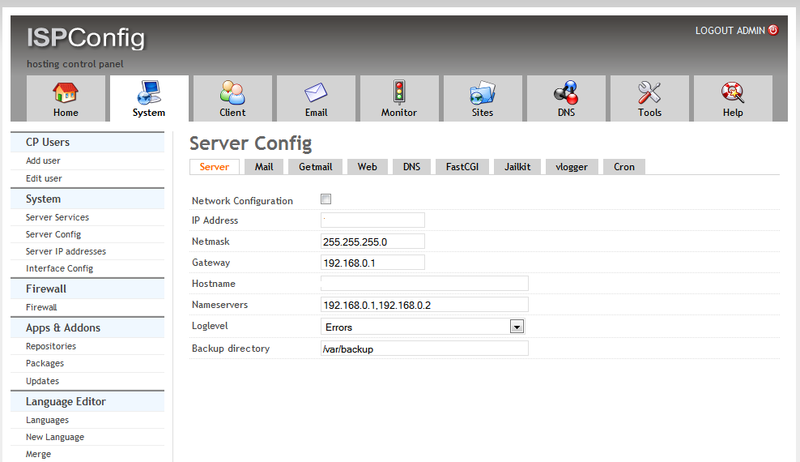 So everything you need to change on your server can be easily done using the web interface and a few mouse clicks. The open source alternative to cPanel, the ISPConfig, is able to do the same – only in a different interface. The ISPConfig was releases in 3.0.3 version a few days back. This new version introduces some new features and makes the ISPConfig 3 the full alternative to the cPanel or Plesk solutions. ISPConfig is now able to change the system settings, manage the e-mail accounts on your server, monitor your server performance, add and manage websites on your server, manage DNS zones and a few more things. ISPConfig is also a tool for managing your customers on the server. If your plan is to create a simple webhosting or to host the pages you build for your own clients, the ISPConfig is a good options how to manage the customers and how to give them a simple control panel to manage their needs. The best on IPSConfig is that there can be different user roles. The administrator is able to use all the features of the ISPConfig. The customers could manage only their account – websites, e-mails and FTP accounts they use. There is also one more role – reseller. The reseller is a person who is able to create other customers and their domains, but is not able to change the server settings. The ISPConfig is available for some Linux distribution as an installable package, but for the most of them there is possibility to install the ISPConfig via the PHP script. Just run php -q install.php command in the install subdirectory of the ISPConfig and continue with the on-screen instructions. It’s very easy. ISPConfig itself will run on http://yourserver.tld:8080/ where you can login as admin with the same password. Don’t forget to change it. If your native language differs from English, you can use many other localization of this open source cPanel or Plesk alternative. When you will log in to your ISPConfig installation, you will see the latest news about the development of the ISPConfig, buttons from the available modules and the list of the current limits. 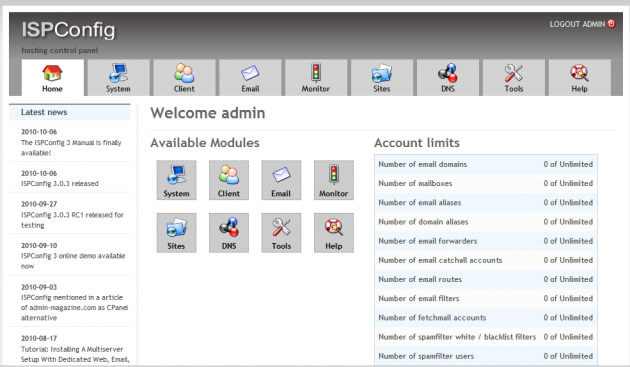 The System tab and module allows you to add users of the control panel, manage the servers and enable or disable the system services, like mailserver, webserver, DNS server, fileserver, database server and VServer. There is also a configuration for logging, IPs, DNSes, FastCGI, Jailkit or cron available. When you create new websites, databases or customers, there is also a key used to the name creation. This predefined key can be also defined on the System tab. It seems the ISPConfig can be extended by the add-on packages, but nothing was found in my version. You can also try to run system updates via the web interface. Each customer can have the mailbox created and the ISPConfig is able to work together with the SquirrelMail. Using the ISPConfig you can set the spamfilter, Fetchmail, Postfix Whilelist and Blacklist. If you are looking where to set the FTP account, check the Sites tab. This is the default place where you will create the websites, FTP account and databases. They can be further managed via the PhpMyAdmin which can be run directly from the ISPConfig. The Sites tab is also a place where you will set up the cron jobs. The ISPConfig gives you the basic information about the traffic for each websites. There is also a simple backup functionality provided. If you are interested in what is doing in your system right now, check the Monitor tab. There will be the logs and many statistics tables and lists about the update state, RAID state, server load, disk usage, memory usage, running services and much more. If you would like to provide DNS server functionality, you can use the DNS tab to manage the DNS zones using the wizard or manually editing. There are also other useful tools in the ISPConfig like the backup functionality. ISPConfig is very good open source alternative to the cPanel or Plesk control panels for your server. I think you don’t need to be a Linux guru to be able to install the ISPConfig and all needed prerequisites. And since you will successfully run the ISPConfig, you can forget to edit the things like Apache configuration files. The ISPConfig will do all these boring things for you. It could be also good alternative, if you run a virtual server from HostGator or Linode and wouldn’t pay the additional fees for the cPanel installation.